the time we were handed a paddle and the raft was set afloat, i knew the adventure has begun. 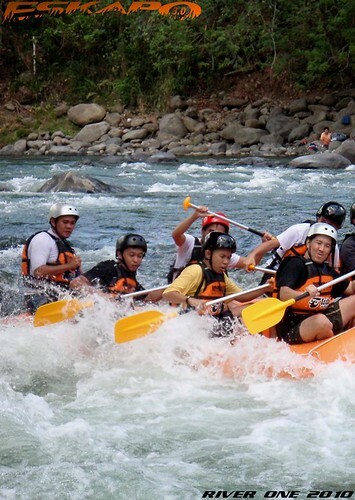 i've been longing to do this and doing it here in Davao was special as i've heard that this river has a good number of rapids. the first thing we did was to be trained how to pull one up when one falls down from the raft. each one has to do it, commanding us to jump and be pulled up by the person opposite your side. it was doable and was actually exciting to start it doing this. you get the feel of the water. it was cold and calm at the put-in area but you can hear the rapids from afar. the sound of adventure. synchronization was important but knowing the commands and doing it correctly seemed to be challenging. 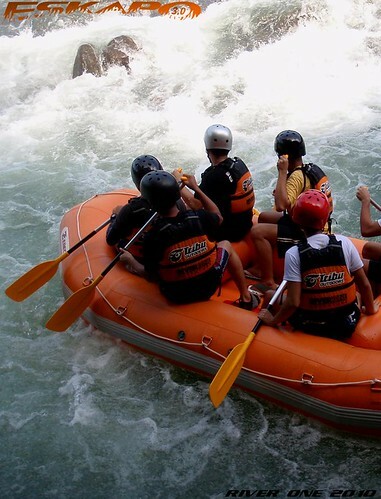 simple commands like "easy forward", "forward right" and "forward left" became a bit complicated when the raft begins to hit the rapids. 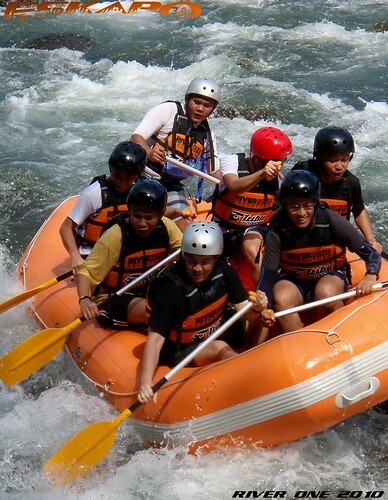 we were laughing all the way as one misses the command because of the excitement of seeing the rapids coming. plain and calm waters comes after each exciting rapid giving us the chance to do drifting which was also our favorite. to drift is just to jump out of the raft, position yourself in a lying form with your head at the back while your foot going ahead and just go with the flow. very similar when one does floating along a lazy river. we encountered a lot of rapids which were just full fun but there were those notable ones like the "washing machine", which by its name itself, you know what to anticipate. the type that we were very excited to encounter. the photo below shows moments before the so called "washing machine". 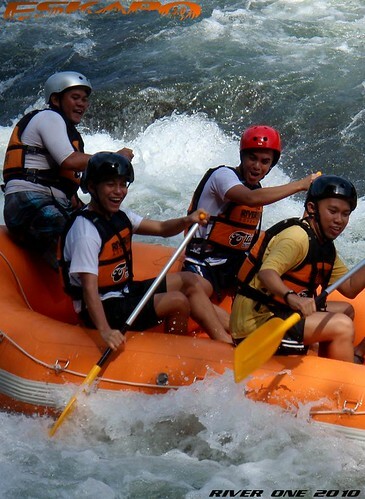 after each rapids conquered, we all raised our paddles and shout high five. a symbol of achievement and the experience of thrill. 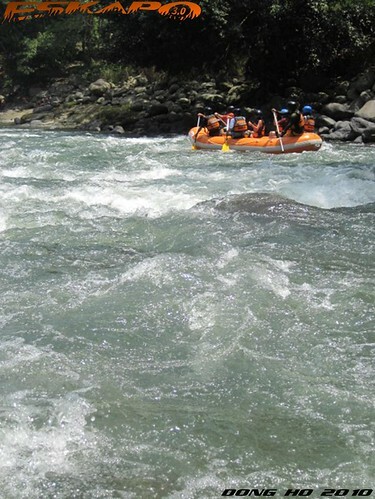 though it is summer, when the water is low and the rapids are not as strong as it can be during the rainy seasons, the notable ones still brought a different excitement. you will be rewarded with great views of high walls on the right side while its mostly flat on the other side. it is here when one can just take shots of the beautiful Davao river. the sun was up but we didn't quite felt the tanning heat, because of the cool environment. as we went along, more rapids were ahead of us with one of our favorite dubbed as "kiss the wall". it's when the river gets narrower leading us no other way but to hit the rocky walls on our right. absolute fun! the last part was to cross the rapids under a large bridge. it was at this point that we again turned 360 degrees while moving forward. best way to end a long wild river experience. 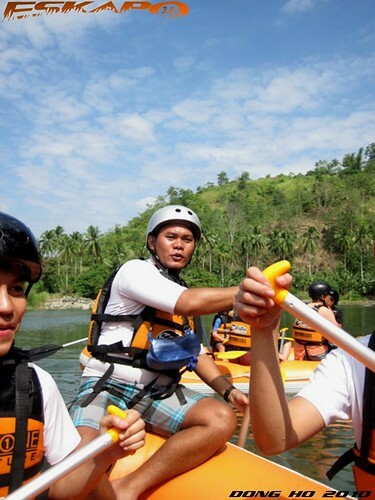 the hours of paddling and drifting was all fun with a great team of River One Adventure Davao. 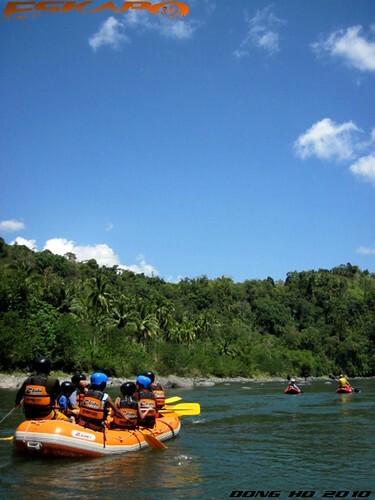 it is when an exciting experience of nature, along with really good friends, experienced and witty guides that makes this adventure most memorable. 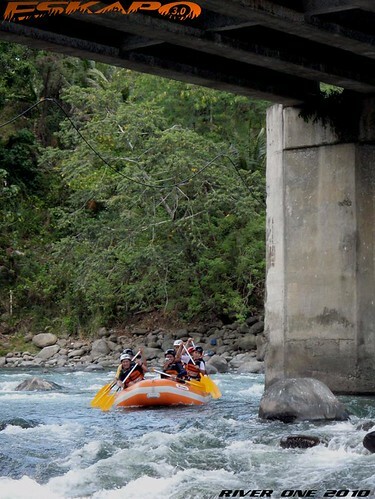 i highly recommend Davao's white water rafting as according to lawstude has more rapids than the ones in Cagayan de Oro. special thanks to River One Adventure for the photos here (with river one watemark) and also to travel buddy Jonee for his all-condition digital camera, which i used during the adventure. 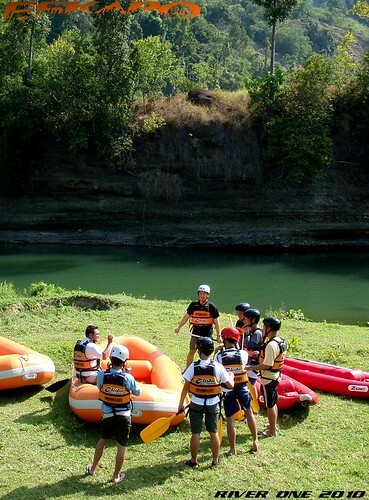 for updated rates, you can contact River One Adventure by email river01advetunre@yahoo.com or contact directly at 09153286857 or (082)-3057624. I really want to try this but i am scared, which makes me wonder if doing this adventure will give me more confidence on water, I don't know jow to swim, tsk tsk. over sa saya. highly recommended. @ sheng - may life vest naman so, kayang kaya mo to. 3,2,1.. camera rolling.. wild action, take one! for there's no take two, otherwise you'll miss the whole scene. wow, grabe. di ko kaya ata kahit me life vest. ang galing! What a thrilling adventure! Your very beautiful images well describe the motion and the fun in that splendid landscape! I really enjoy this post! Wow, looks very exciting! Seems like sobrang nangangapa pa kayo. What an experience! Grabe, ganda ng place na to sa Davao ah. I don't know how to swim but I welcome any adventures, even if it involves water! As long as I don't get killed LOL. how exciting! 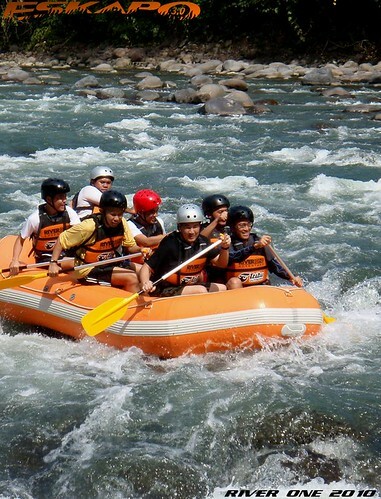 i didn't know there's white water rafting in Davao! will definitely try this the next time I visit Davao. love the pictures! Great adventure! Good thing you did not soak your camera! 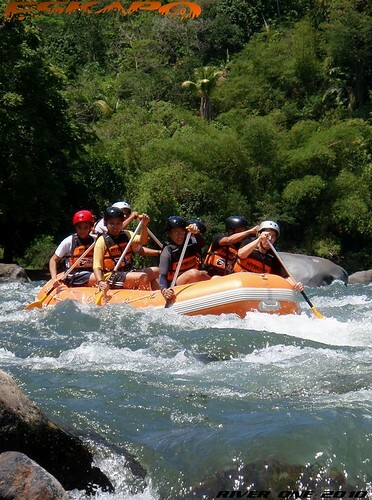 As I was told before, the Davao river rapids are rated at Class III (with two @ Class IV) which should provide enough thrill for newbies. I really should do this next time. >Sheng, it's ultimate fun! you have lifevest so it's safe and if you just want to enjoy it with slower flow, go there from feb-may. i guarantee you ultimate fun! >Princess dyanie, knowing you i believe you can do it. go there between feb-may. 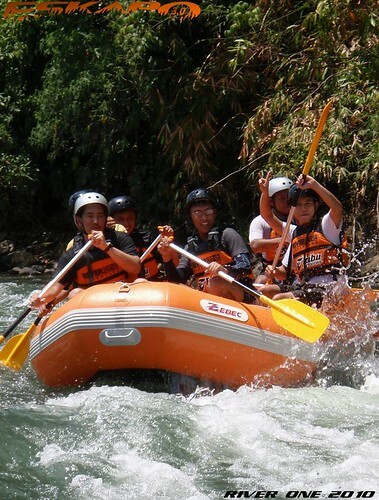 when we were there, the other raft consists of kids to around 9-14years old and they enjoyed it. >Skippyheart, hahaha... maybe for now but not when you'll have your chance. >Nuts, kayang kaya yan. 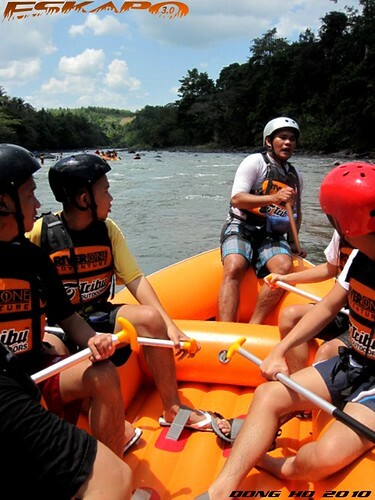 same as i recommended Sheng and Dyanie, go there between feb to may if you want just the fun type of rafting. i can't resist but to take shots while we were on the raft. sometimes, i have the camera on one hand shooting while paddling. that's when i say "you can do two things at the same time". >Halfcrazy, nangapa pa nga pero sa pagbabalik siguradong exciting kasi babalik kami at masubukan ang rainy season when it's at its best. >Sid, lol. nobody drowned that day. we all have life vest. in , we enjoy every time we had our chance to hit the water. >Luna, highly recommended to sa Davao. let me know when you're going there. 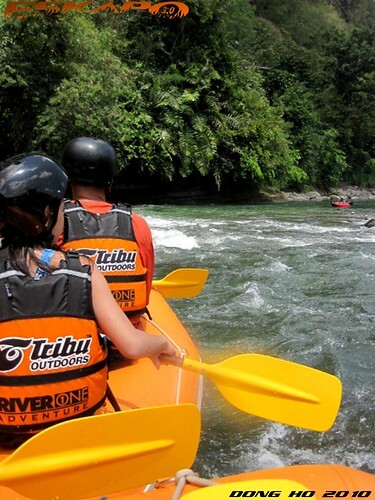 take River One Adventure for this. >Dennis, i had it locked on my wrist kaya safe. >Nomadic, yes. look for the River One Adventure team, a very cool team. >Fufu, you should. we'll wait for your post on that. >Xprosaic, madali lang yan. book niyo na para sigurado na. Wow looked like so much fun. I am sure my sons would love to go on the water raft. Yesterday, both sons went for some water sport. They came back so tanned. I probably do not have the courage to take a raft. Hahaha!ang ganda ng kuha,nakakaaliw kayong tingnan. sobrang saya siguro nito kahit obvious na nakakapagod! 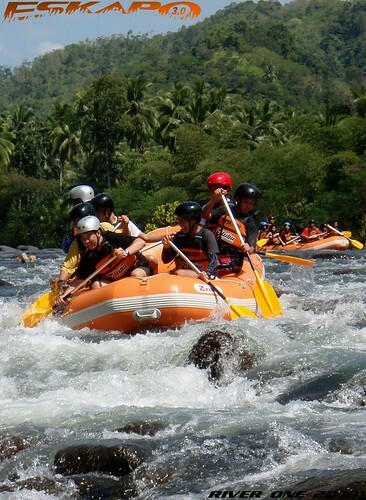 ilang cups of rice kaya pagkatapos mag rafting? haha! great images captured while in action! should do this someday. You showed with your pictures how much fun could be had in this activity. However, I am far too chicken to try this, plus I am not a swimmer which makes me really avoid it. Yan ang gusto kong gawin pero hindi ko talagang kaya dahil takot ako. hanggang tingin na lang talaga ako. That is an awesome river experience. The excitement and adrenalin rush must make it very memorable. 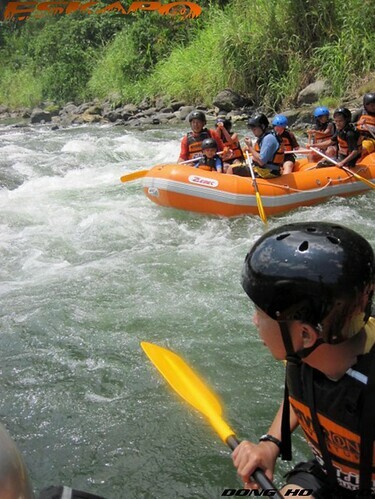 wow..i really wanna try water rafting...the nearest from our hometown is in cagayan de oro! i feel so thrilled looking at your shots....which still never fail to impress me! AYOS! Goodness! 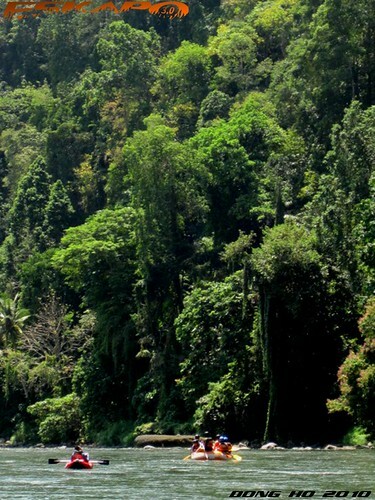 I am out of breath after following this river journey. You amaze me. Great pictures! Especially the ones right on the action and the breath taking views along the river. Everybody looked like they really had grand time. 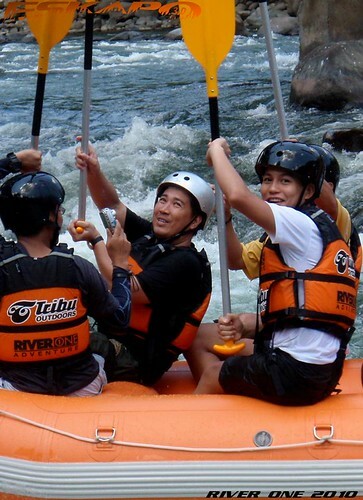 I can never forget the exhilarating feeling paddling across the raging rapids, Paddle forward! Great photos! 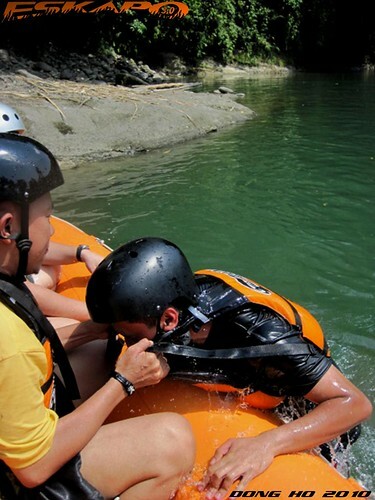 You really enjoyed water rafting. 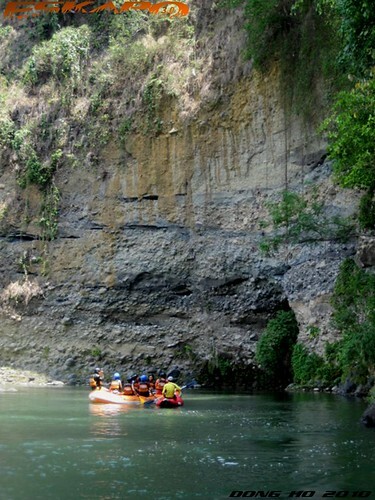 I've been Cagayan for almost a year, but still haven't experience rafting because I am too scared to try this. I am scared if the boat will tumble down and will hit parts of my body from the rocks. :( That is why I never dare to try it. 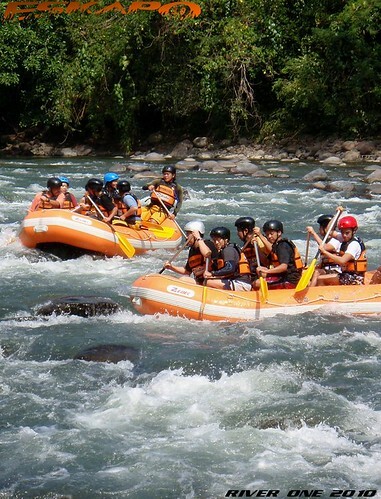 A trip to Cagayan de Oro is not complete when you haven’t tried Whitewater rafting. A fun and thrilling ride with scenic view of the border mountains of Cagayan de Oro and Bukidnon, not to mention the rock formations.